There are a couple of accepted ways to hold the yarn or thread - this is the one I personally prefer. Fingers should be relaxed and close together. Never hold the yarn tightly - allow it to slide easily between your fingers. Hold the hook as you would a pen or pencil. Make a loop as shown, hook the yarn and pull it through. Do not pull tight. 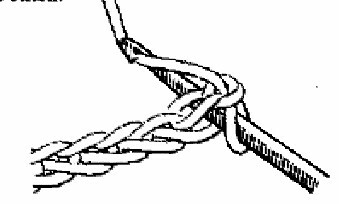 This counts as the first stitch in any chain. Loop the yarn over the hook (yo) and pull through again. Continue until you have made as many chains as the pattern calls for. ALWAYS double-check your count. Make a chain of about 20 for a practice piece. 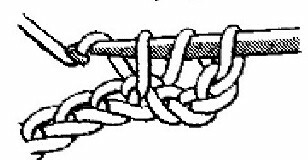 Insert the hook under the top 2 threads of the third chain from the hook. Do not count the loop on the hook. Loop the yarn over (yo) and pull it though. There are now 2 loops on the hook. 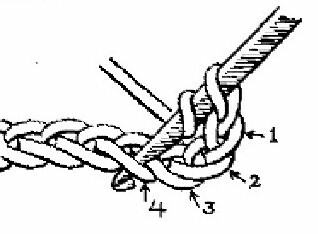 Yarn over again and draw through both loops. This completes one single crochet. Insert hook under top 2 threads of next chain and complete as before. 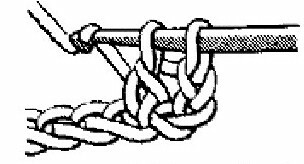 Continue until you have made a single crochet in each chain, then chain 2 for turning. Turn work counter-clockwise. This ch2 represents the first sc of the next row, so the first actual sc is left open unless you are increasing at the beginning of the row. 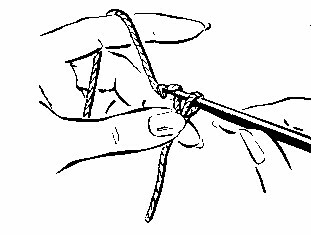 Insert hook under the top 2 threads of the next stitch and proceed as before. At the end of each row, sc in the top chain of the ch2 that began that row. 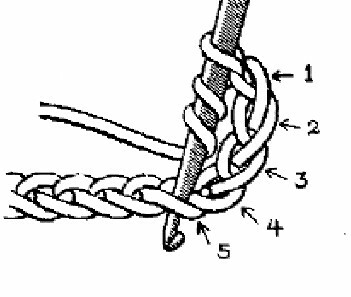 Note: Unless otherwise specified, always pick up the top two threads of each stitch. Picking up only the back thread creates a ridge, and is used for special effect. 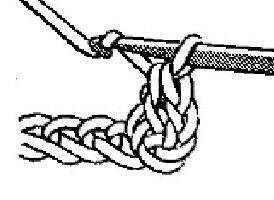 Make a sample chain as for single crochet. Loop yarn over and insert hook under top 2 threads of 4th chain from hook as shown. Yarn over and draw through the stitch. 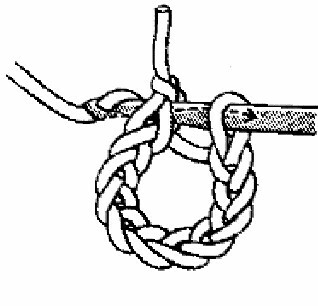 There are now 3 loops on hook. Yarn over again and draw though 2 loops..Two loops remain on hook. Yarn over and draw through last 2 loops. This completes one double crochet. Yarn over and insert hook under top 2 threads of next chain. Complete dc as before and continue to end of chain. Ch3 and turn counter-clockwise. 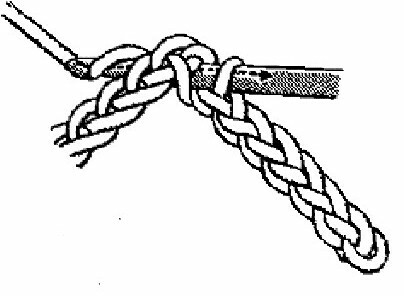 This ch3 counts as the first dc of the next row, so the actual first stitch is left open unless you are increasing at the beginning of the row. At the end of each row, dc in the top ch of the ch3 that began that row. 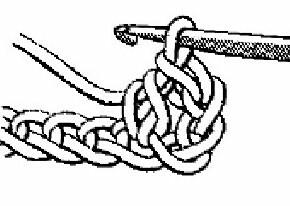 Yarn over and draw through all 3 loops on hook. Row of hdc uses ch2 to turn. Note: The designer of a pattern will usually recommend a particular yarn or type of yarn to be used as well as the preferred hook size. 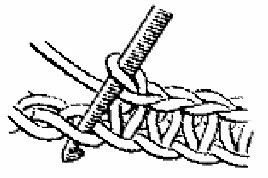 However, yarn diameters vary greatly from one manufacturer to another, so it is always advisable to make a test swatch and check it against the gauge given. You may need to use a larger or smaller hook to achieve the desired results. Make foundation chain as before. 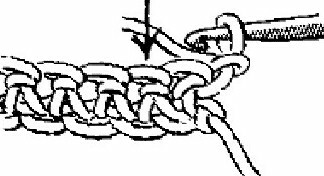 Yarn over twice and insert hook into 5th chain from hook as shown. Yarn over and pull through chain. 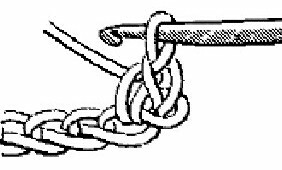 There are now 4 loops on hook. 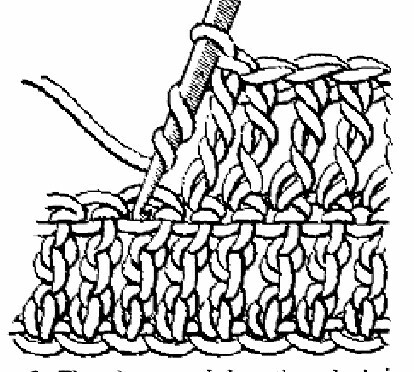 Yarn over and draw through 2 loops, leaving 3 loops on hook. 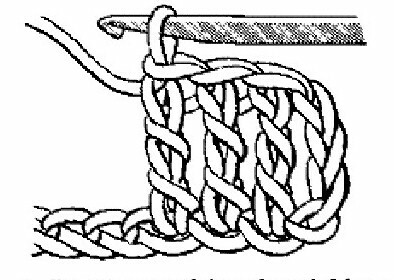 Yarn over and draw though 2 loops, leaving 2 loops. Yarn over and draw through remaining 2 loops. This completes one treble crochet. Yarn over twice and insert hook under top 2 threads of next stitch. Complete stitch as before and continue to end of row. Chain 4 to turn. 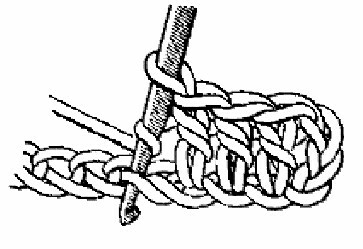 Used for joining or where an invisible stitch is needed. Insert hook through top 2 threads of stitch, yarn over and pull through all loops.